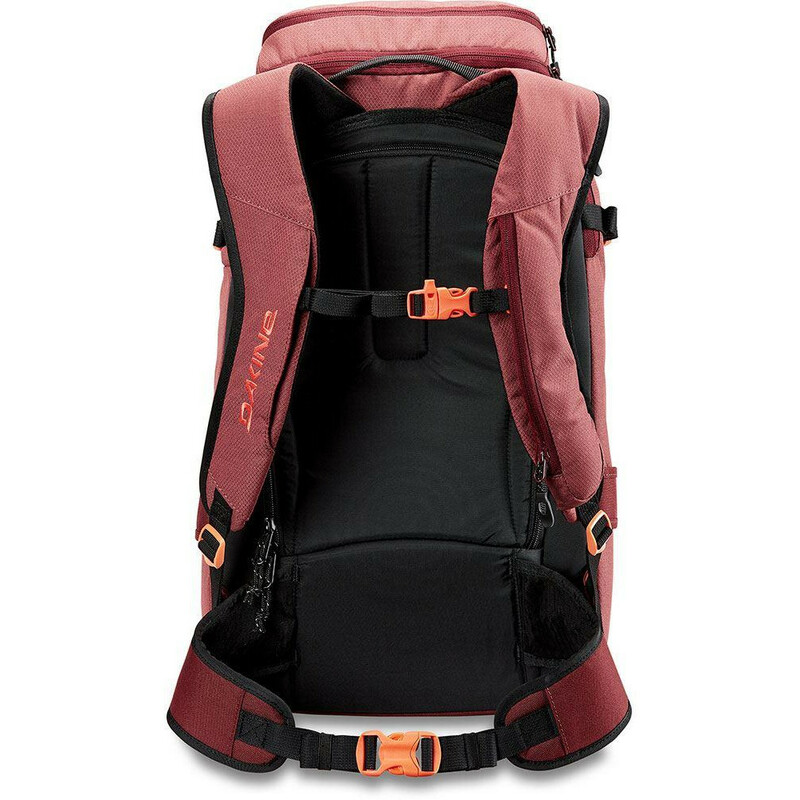 Dakine Womens Heli Pro 24L Backpack 2018 Burnt Rose. 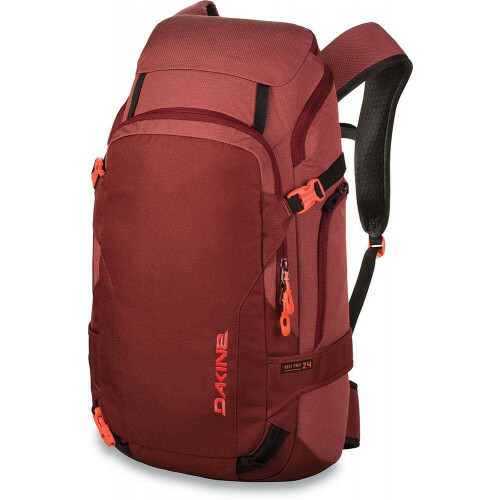 Dakine Womens Heli Pro 24L Backpack 2018 Burnt Rose Featuring a female-specific fit in the shoulder straps, padded hipbelt, and overall silhouette, this snow pack is versatile, functional, and holds everything you need for a day hunting fresh lines in or out of bounds. 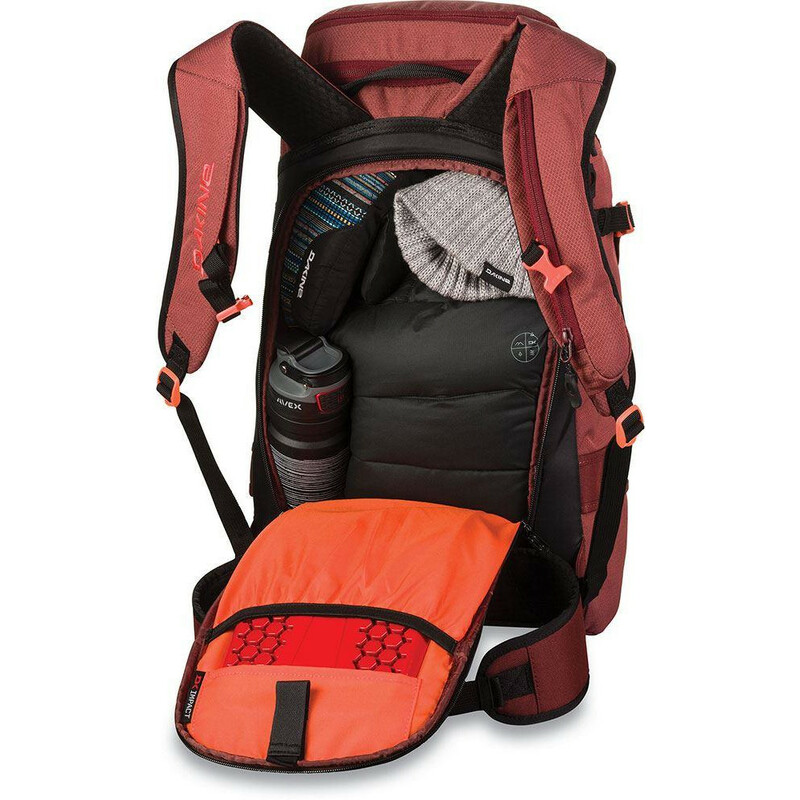 The diagonal ski carry function loads quickly, while the A-frame ski carry and vertical snowboard carry works best for bootpacking through thick trees or sketchy terrain. With a fleece lined goggle pocket, a main compartment for gloves, hats, and outerwear, and a front-access pocket designed to hold a shovel and snow tools, you can head out of bounds knowing your kit is ready. DETAILS Limited Lifetime Warranty Women's specific fit Vertical snowboard carry Diagonal / A-frame ski carry Backpanel zippered main access DK Impact Spine Protector compatible (sold separately) Snow tool/shovel pocket Fleece lined goggle pocket Zippered vertical side pocket Front helmet attachment loops Padded hipbelt and backpanel Rescue whistle on sternum strap MATERIALS 600D Polyester DIMENSIONS 1465 cu.in. [ 24L ] 22 x 12 x 7" [ 56 x 30 x 18cm ] 2.0 lbs. [ 1kg ] CARE INSTRUCTIONS If your Dakine bag gets dirty, we recommend hand washing with mild soap (like Nikwax Tech Wash), cold water and a soft bristle brush. If hand washing is not going to do the trick, use a front loader washing machine. To ensure your backpack doesn't get tangled, place inside a pillowcase or mesh bag before washing. Always use cold water, mild soap and run on a gentle cycle. Never bleach your pack. Hang to dry in a warm but shady place, ensuring both inside and out are dry before storing.